* Update picture gallery Fossils-page: Ginkgoites watsoniae sp. nov., Arizona. * New photo photospecial page: Ginkgo tree and statue of nymph on dolphin, Jardin des Plantes, Paris. 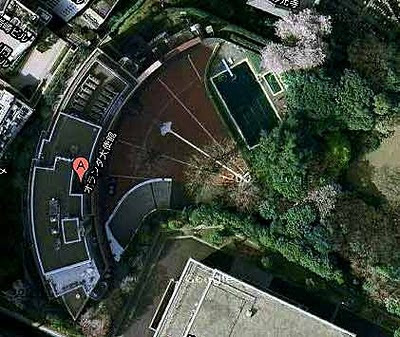 One year -2010- in the life of a Ginkgo tree in Japan seen from a balcony. Video by Smilingraphy on YouTube. * Added to my Art-page (picture gallery): Ginkgo sculptures by Rudi Jass. * Added new topic: Ginkgo world game. * Added to my Art-page (picture gallery): Ginkgo leaf square in Tokyo, design by Karin Daan. "Ginkgo" game. Change the world with every bounce. You play as Ginkgo, a furry creature with bouncing abilities. 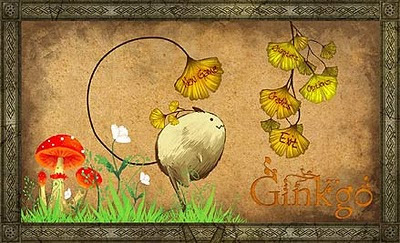 Ginkgo's world has been infected by a pollen & caused all plants and creatures to decay. Ginkgo now has to use its bouncing abilities to revive its world. "Acoulia, the legendary land of the east is a beautiful forest full of life where the seasons are controlled by the Tree of Seasons. A little Ginkgo growing on the Ginkgo Tree is almost ripe and has been watching the land, unable to wait to enter and live in the beautiful forest of Acoulia. Ginkgo is woken up by a melancholy tune. This tune comes from a gigantic flying Ocarina creature that has a dark pollen forest on its back. The Ocarina creature then flies into a rain cloud and the pollen from its back turns the rain black. All of Acoulia then gets infected because of this rain. 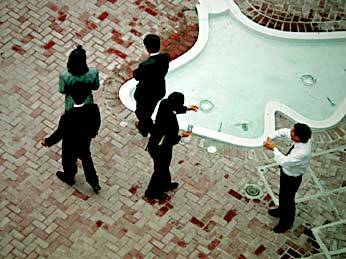 Forests decay, animals become hostile and begin to attack each other. Ginkgo witnesses all of this while the Ginkgo tree begins to decay. Ginkgo then wiggles out from the fruit and is the only survivor from the Ginkgo Tree. Ginkgo enters the infected world and finds a way to restore the world using its bouncing ability." Download free Ginkgo game here. Pdf with more info here. Ginkgo is a student project from the Vancouver Film School. It was made from concept to product by a five member team, along with five collaborators in a span of five months. 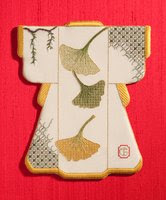 Ginkgo card 2011 brings good luck. It depicts a Ginkgo leaf and Ito Hirobumi, first prime minister of Japan. Tourist office in Hikari, Yamaguchi prefecture, Japan.